This general lack of awareness of xylitol and the danger it poses, coupled with the high toxic potency of xylitol in dogs, presents a huge problem! And it’s a problem that’s getting bigger every year, as xylitol is gaining in popularity and being added to more and more common products. In fact, odds are good that you have something containing xylitol in your medicine cabinet, your pantry, or even your PURSE right now... without even being aware of it! This comment was posted on the MNN site when they shared our peanut butter article. Xylitol is a "sugar alcohol," a natural sugar substitute that, because of its anti-cavity properties for human teeth, is commonly found in “sugar-free” gum, mints, toothpastes, and mouthwashes. Since it’s also considered a good sugar substitute for diabetics, xylitol is commonly used in sugar-free baked goods too, such as cookies and muffins. Xylitol is also present in some brands of children’s chewable vitamins and other supplements. And it's now even being added to certain brands of PEANUT BUTTER! Have you ever treated your dogs with peanut butter or used it to help give them some medication? 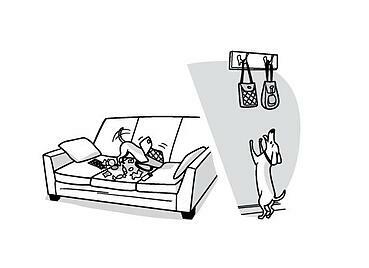 Has your dog ever raided the pantry or gotten into your bag or purse? It's situations like these that can cause (and routinely have caused) dogs a lot of problems, and their families a lot of stress, money, and heartbreak. At least if everybody knew about xylitol, and they knew how dangerous xylitol is for their dogs, they could exercise the caution necessary to keep xylitol out of their dog's mouth. And if their dog got into something containing xylitol, they'd at least be aware of the importance of taking them to the vet immediately. Time is of the essence in treating any toxicity, and that's especially so with xylitol toxicity - as its effects (see below) can be seen in as little as 30 minutes and they can be absolutely devestating. Can you see why this awareness is SO IMPORTANT! In a 2004 paper, Veterinary Toxicologist, Dr. Erik Dunayer, of the ASPCA predicted that “with the increased appearance of xylitol-sweetened products in the US, xylitol toxicosis in dogs may become more common.” And right he was! According to Dr. Tina Wismer, Veterinary Toxicologist and Medical Director of the ASPCA Animal Poison Control Center, in 2007, when they first began keeping count of the number of xylitol poisoning calls they were receiving, they logged 1,764 cases (an average of less than five cases each day). Fast forward to 2014 and the xylitol-related calls have more than doubled, reaching 3,727. That means that there’s now an average of over TEN calls about dogs being sickened and possibly killed by xylitol EACH day! But even that number is an underestimate, as it represents only the number of cases that are called into the ASPCA-APCC. This number doesn’t include the calls that Pet Poison Helpline and any other poison control hotlines receive, and they also don’t take into account all of the xylitol toxicity cases that never get phoned into poison control at all. Many cases are handled at the local animal ER hospital or General Practice clinic without such calls ever being made, and some dogs sadly don’t even make it to the vet. Xylitol Is Toxic To Dogs. How Much Is Too Much? If you suspect your dog has eaten xylitol, or something containing xylitol read this article first! There's a list of what to look out for and what to do. Time is of the essence!! Because it's such a strong stimulator of insulin release in dogs, it takes just a small amount of xylitol (0.1g/kg) eaten by a dog to cause a dangerous drop in blood sugar ("hypoglycemia"). Mild hypoglycemia will typically cause weakness and a lack of coordination. 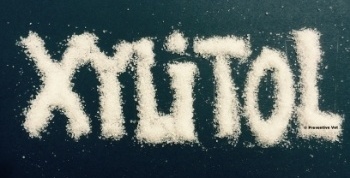 More pronounced hypoglycemia, such as that which often happens with xylitol ingestion, can lead to seizures, coma, and even death. Xylitol can cause a dangerous drop in your dog's blood sugar in as little as 30 minutes! 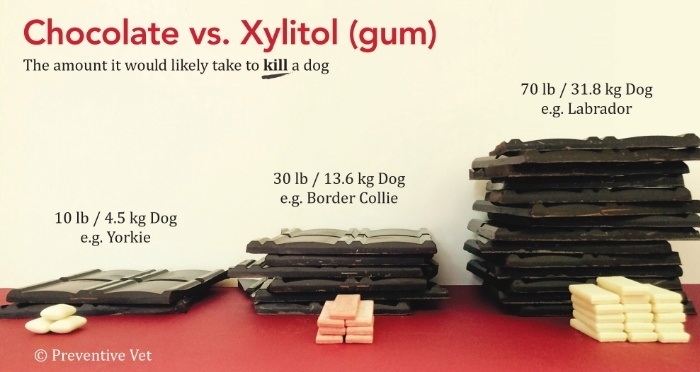 As if that weren't enough, if a dog eats just 0.5g/kg of xylitol (still a very small amount - see the table and picture below) they are at risk of suffering from "acute hepatic necrosis." Literally translated, "acute hepatic necrosis" means "sudden liver death" and it is a severely debilitating, and frequently fatal form of liver failure. If you're not sure what “0.1g/kg” and “0.5 g/kg” mean, you’re not alone. These are dosages — meaning the weight of something, in this case xylitol, related to body weight. 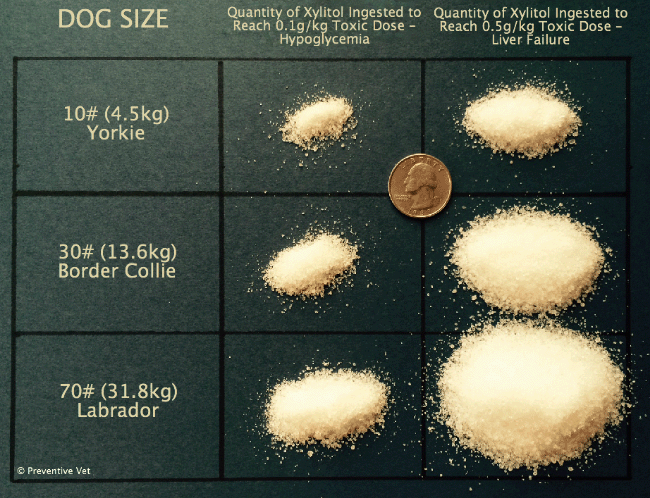 The "toxic doses" of xylitol for a 10lb dog, 30lb dog, and a 70lb dog are shown in the table and the picture below. While looking at these numbers and piles of xylitol, keep in mind that the typical sugar packet that you might put in your morning coffee weighs 1 gram — more than TWICE the weight of xylitol (0.45 grams) it would take to cause hypoglycemia in a 10lb dog! How Much Xylitol Is In Gum (Or Other Products)? It’s Not Always Possible To Figure It Out. 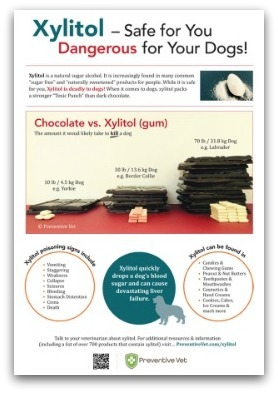 Here’s the other big part of the problem with xylitol, as it relates to dogs. Though xylitol must be noted in the ingredient list of any product it’s included in, the exact amount or concentration of xylitol in many products doesn’t have to be disclosed, and often isn't. Without this important information it is extremely difficult to acurately determine a dog's ingested dose in cases of poisoning. As a result, the "worst-case scenario" often has to be assumed, meaning that dogs may be put through unnecessary testing and hospitalization, and their people may be suffering unnecessary emotional and financial turmoil. Both situations that could often be avoided if xylitol concentrations in products were clearly stated on product packaging and well known within the animal poison control and veterinary medical communities. Sadly, manufacturers often guard these concentrations as proprietary trade secrets — see the hoops one vet had to go through to get this information from a gum manufacturer just to treat one of her patients. You can help change this though! Read, sign, and share these petitions to increase xylitol awareness and information on product packaging. There's one petition that’s an “open call” to product manufacturers, and one that asks the FDA to mandate such awareness and warnings on product labels and packaging. Until this label awareness becomes common practice (or law) it’s safest to assume that a dog eating eating any amount of gum, mints, peanut butter, or any other food with xylitol in the ingredient list could be enough to cause serious and potentially fatal problems, and therefore warrants an immediate call to an animal-specific poison control hotline or veterinary evaluation. The same should be assumed with ingestion of xylitol-containing toothpastes, mouthwashes, and chewable vitamins, too. In fact, with anything containing xylitol. Immediate recognition of the danger and prompt treatment are of the utmost importance when it comes to xylitol ingestion in dogs. Especially since activated charcoal, a helpful treatment used commonly in many poisoning cases, doesn’t appear to help in cases of xylitol ingestion. In the event your dog develops hypoglycemia from xylitol ingestion, they will need to be admitted to the hospital for intensive monitoring, and they'll need to be put on an IV dextrose (a source of glucose for your dog's body) drip to support and stabilize their blood sugar levels. The duration of their hospital stay will vary with the severity of their clinical signs and their response to treatment, but you should expect at least a full day of hospitalization (often 24-48 hours is more likely). With early and aggressive treatment, the prognosis for xylitol-induced hypoglycemia is typically good, but you should be prepared to pay several hundred to a couple thousand dollars for treatment costs and the intensive monitoring that is typically necessary. If your dog is unfortunate enough to develop liver failure from xylitol ingestion, their prognosis will likely not be good. These pets require very aggressive care because of the range of vital functions the liver has (blood clotting, blood detoxification, blood pressure, and many others). These dogs will often spend at least 72 hours in the hospital and treatment costs will likely be well into the thousands of dollars. Many of these unfortunate dogs die from their liver failure or are euthanized when the costs skyrocket and the prognosis worsens. If you're out grocery shopping, sharing a treat with your dog, or you've just noticed that your dog got into something they shouldn't have, from your bag, cupboard, or off the kitchen counter - check the ingredients right away! Xylitol is a natural sugar substitute and is being used more and more for its diabetic and dental benefits in people, but it's toxic to and can be fatal to dogs. If you brush your dog’s teeth, be sure to use only pet-specific toothpastes. Not only will they not contain xylitol, but they also won’t contain fluoride – which can also be toxic to pets. Maintain leash control over your dogs when out on walks. This will help prevent ‘scavenging’ (the act of your dog eating things off the ground). Amongst other things, a scavenging dog could ingest discarded xylitol-containing gum or somebody’s dropped xylitol-containing muffin. Consider using a head collar (such as the Gentle Leader® or Halti®) or basket muzzle on dogs that are known to scavenge. 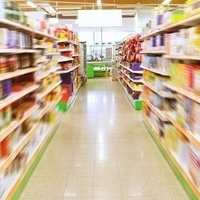 Check the ingredient label of any product you buy, keep in your purse, pockets or around your house. Exercise strict caution around your dogs with any products that have xylitol in their ingredient list. Check out our list of over 700 products that contain xylitol. If your dog ever gets into your gum, mints, peanut butter, or anything else, be sure to check the ingredient label and immediately contact your veterinarian, your local Animal ER, or a pet-specific poison control hotline if xylitol is mentioned anywhere in the ingredient list. Join us in our #XylitolTreasureHunt on Twitter. Help dog lovers everywhere know how careful they need to be and how important it is to read labels. Post pics of xylitol-containing product labels and ingredient lists on Twitter using the hashtags #XylitolTreasureHunt and #Dogs, and tag us (@PreventiveVet) to help build the most comprehensive list of xylitol-containing products so that we can get this awareness trending. Help convince the manufacturers of xylitol-containing products to begin including xylitol concentrations and awareness warnings on their product packaging. We’ve got two petitions going — one directly to the product manufacturers in hopes that they will do the right thing voluntarily, the other to the FDA asking that they mandate the inclusion of such awareness warnings and xylitol concentrations on product packaging, should the product manufacturers not do so on their own. With awareness, understanding and some simple preventive measures, keeping dogs away from xylitol – and away from the emergency room due to xylitol toxicity – is a mission that we can all achieve. Stimulation of insulin secretion by xylitol in dogs. Endocrinology, vol. 84, issue 2, 1969. Plasma insulin concentrations in dogs and monkeys after xylitol, glucose or tolbutamide infusion. Diabetes, vol. 19, issue 1, Jan. 1970. New findings on the effects of xylitol ingestion in dogs. 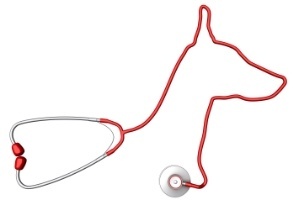 Veterinary Medicine, 2006. Xylitol intoxication associated with fulminant hepatic failure in a dog. Journal of Veterinary Emergency and Critical Care, vol. 17, issue 3, Sept. 2007. Experimental acute toxicity of xylitol in dogs. Journal of Veterinary Pharmacology and Therapeutics, vol. 32, issue 5, Oct. 2009.